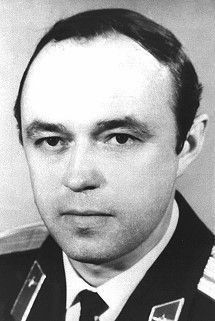 Russian engineer cosmonaut 1965-1980. Graduated from Moscow Aviation Institute Soviet Air Force, liaising with aircraft industrial enterprises. Cosmonaut training November 1965 - December 1967. Worked at Gagarin Cosmonaut Training Center. Killed in an auto crash. Status: Deceased; Active 1965-1980. Born: 1939-02-03. Died: 1993-11-25. Birth Place: Leningrad. Family: Cosmonaut. Country: Russia. Flights: Soyuz 24, Soyuz 25A, TKS-2, TKS-3, Salyut 7/TKS-3. Agency: VVS. Bibliography: 4452. 1939 February 3 - . Birth of Vladimir Yevgenyevich Preobrazhensky - . Nation: Russia. Related Persons: Preobrazhensky. TKS-3 (cancelled) - . Crew: Preobrazhensky, Sarafanov, Yuyukov. Backup Crew: Grechanik, Rozhdestvensky, Vasyutin. Nation: Russia. Program: Almaz. Flight: TKS-3. Spacecraft: TKS. Third TKS flight that would have docked with the cancelled Almaz OPS 4 military space station. The spacecraft was instead flown unmanned to Salyut 7 as Cosmos 1686..
1993 November 25 - . Cosmonaut Vladimir Yevgenyevich Preobrazhensky dies at age of 54 -- Killed in auto crash. - . Nation: Russia. Related Persons: Preobrazhensky.